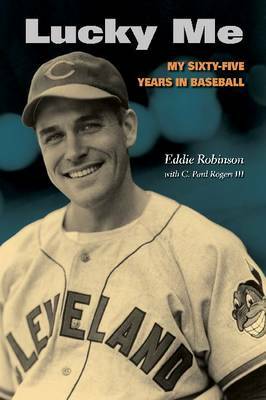 Eddie Robinson s career spans the pre-integration era before and during World War II, integration, the organization of the players union, expansion, use of artificial turf, free agency, labor stoppages, and even the steroid era. Today Eddie is working to secure pension benefits for former players not covered by the major league labor agreement. During his six and a half decades in America s pastime, Eddie has known, played with or against, or worked for Babe Ruth, Ted Williams, Jackie Robinson, Tris Speaker, Bob Feller, Hank Greenberg, Larry Doby, Satchel Paige, Bill Veeck, Clark Griffith, Joe DiMaggio, Yogi Berra, Mickey Mantle, Casey Stengel, Whitey Ford, Brooks Robinson, Paul Richards, Charley Finley, Hank Aaron, Ted Turner, and George Steinbrenner. Eddie Robinson was a fine ballplayer. He had a remarkably long, fascinating, and colorful career as a baseball scout and front-office man for many big-league teams. I know of no work that gives as much insight into the front-office machinations in baseball organizations. His autobiography will interest people inside baseball who remember Eddie and many others who enjoy reading about the experiences of men who ve been in the game. Charles C. Alexander, author of "Ty Cobb" Eddie Robinson was general manager when I was asked to manage the Orioles 1960 Winter Instructional League team. He took me under his wing and showed me just by being himself how a major leaguer should act. When I later became the Orioles manager, all the things I learned from him were invaluable to my future successes. Earl Weaver, Hall of Fame manager for the Baltimore Orioles Of those sixty-five years in baseball, I ve known Eddie for fifty-five of them as a dear friend, a business partner, and as a terrific baseball player. Major league baseball needs more people like Eddie. Brooks C. Robinson, Hall of Fame third baseman for the Baltimore Orioles"